Last week my copy of this tasty looking book arrived all the way from America and I sat up with it gazing at all the yummy looking treats inside. My favourites to look at were the pretty looking cakes in the last section, that was until I read that they were all made with crochet thread and so would probably take quite a bit of work (as well as a whole stash of crochet thread in a large number of colours) to recreate. Slightly disappointed I decided to give some of the fruit a try - starting with strawberries. Apart from there being a confusing error in the pattern I was very pleased with how mine turned out and before long I had four juicy looking strawberries so I started on some of the other tropical fruit on offer. I tried to keep to some of the more recognisable fruits as these were destined to be play food for little ones (there were also patterns for a persimmon slice, peach slice and pineapple slice) and after a few issues with a couple of the patterns I ended up with a lovely collection of tasty looking fruit. Because I wanted my fruits to be easily recognisable I had to alter some of the patterns a little, my orange segments have a white pith and an orange rind - which though a little more of a fuss does mean they look more like orange slices. I also made the white centre in my kiwi slices a little larger and I embroidered far more black seeds in mine to try and make them look more real. After all this healthy food I decided to give a sandwich a go, and because I loved the look of the tomato slices shown in the book I decided to make up a BLT. Again I found a problem with one of the patterns, the instructions for the lettuce were slightly wrong and were quite hard to figure out how to fix. After reworking it a couple of times I really loved how it looks and think that the design is lovely, but the instructions need rewriting. My bacon got real crochet streaks of fat as I felt that the running stitch shown in the book looked a little naff. And because I ran out of time I didn't make up the slices of bread and just used some of the bread I had made previously that was tucked in my son's play food box. This book was sadly not as good as I was hoping it would be. There are a number of errors in the patterns that would make it very confusing for a beginner to use - which is such a shame as more pattern testing would have highlighted all of these. The patterns all look lovely, though because this focuses more on adult food tastes like sushi and a fun looking cheese board, there is little that I would end up actually making. 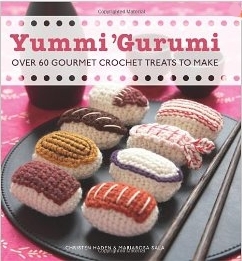 I just don't know anyone who could use a crochet bottle of wine or a crochet stir fry. After trying diligently to get through some of my more tricky UFOs I've succumbed to doing some fun crochet as I'm rubbish at working through projects when the going starts to get tough. What tempted me away was a free pattern by June Gilbank called 'Love Hearts' which gives you detailed instructions for how to make these very cute hearts. On the left are the three different sizes worked in crochet thread - they are so tiny and very cute... I used them on my husband's date-a-versary card and they look so good I may have a go at doing some more in thread. Seeing as the thread hearts only took an hour to hook up I thought I would try making some with my DK wool, and this time I went with making the puffy hearts. They look so cute and squishy with a little stuffing in and I got pretty carried away with using up scraps of DK wool that after a couple of evenings of crochet I found I had made this pretty garland! This is a lovely quick and easy pattern and makes some really lovely heart motifs. What would you use them for? My lovely card making course is now drawing to a close so I thought this would be a good time to show you a selection of the different cards that I've made. I've really enjoyed doing some paper craft for a change, it's so nice to do something different from crochet and sewing occasionally and I'll definitely be giving some of the techniques another go in any future cards I make. The other half of the course is about how to run your own small business which is giving me lots of grand ideas - perhaps 2011 will be the year I give that a go? Just thought I would put up a couple of magazine reviews this Friday as I've been getting a bit behind with doing them and they aren't much use if you get them 3 or 4 months late! 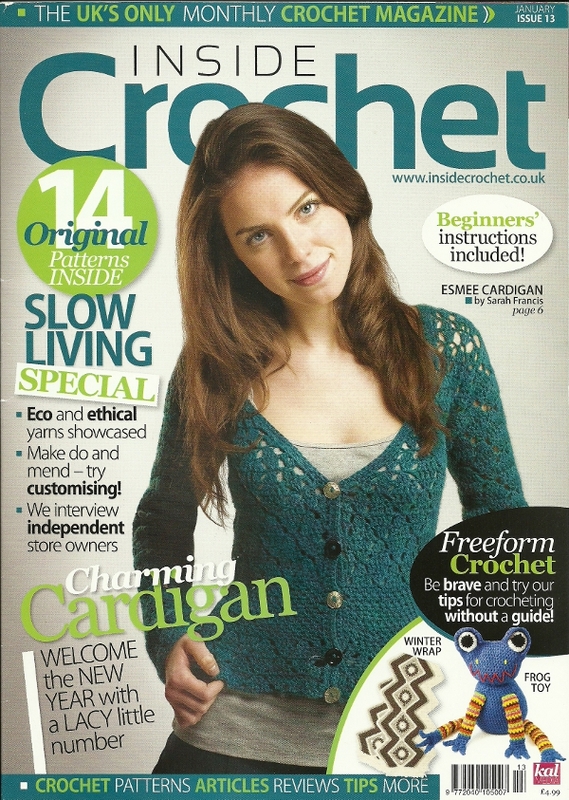 This issue of Inside Crochet starts the New Year on the right foot with a good collection of patterns including the beautiful 'Esmee cardigan' by Sarah Francis which I am definitely making for myself one day. There are also patterns for some cute kids stripy jumpers, a very pretty 'Lily shawl' and a lovely 'Henna rug' which would look so pretty on our wooden floor. As well as having plenty of good patterns this month there are also some great articles covering topics like customising your clothes, doing freeform crochet (which has intrigued me for a while and I may well have a try myself soon...), and some interviews with a couple of London based ethical craft shops which look fantastic (Fabrications and Prick your finger). 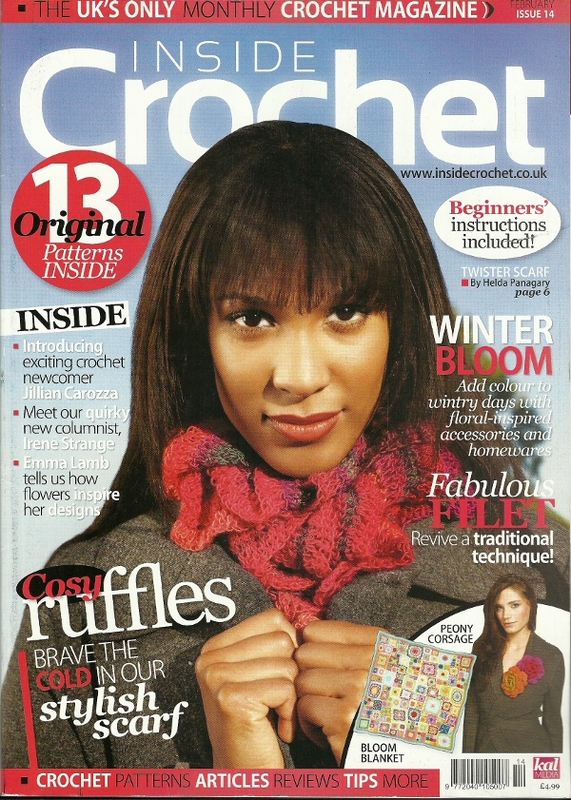 I really enjoyed reading through this issue of Inside Crochet too. There are some lovely patterns in here with my favourite being the 'Bloom blanket' by Rebecca Velasquez which looks so very bright and cheerful that it would be perfect for bringing Spring into your home nice and early. I also really like the 'Valentine settings' place mats, the pretty bobbily 'Artichoke hat' and the cosy looking 'Cherry wrap', so lots to keep you busy this month. The articles also make a good read with a feature about filet crochet, some impressive fashion crochet pieces and a fantastic interview with Emma Lamb who makes some very beautiful crochet banners, cushions and pot holders that are bursting with colour. So far I seem to be doing quite well with my resolution to finish off some of my long forgotten projects. I've finally gotten round to putting the last touches on my patchwork - all that was needed was a lining adding and then it was done. Did any of you manage to guess what it is? Top marks for anyone out there shouting "it's a tea cosy!" go and make yourself a cuppa right now as a reward for your good sense. For a girl who loves her tea as much as I do it seems crazy that I've never had one of these, so when we were given the option to try making one at my local mum's craft group I jumped at the chance. Now I just need to invite some friends round for tea and cake and show it off to the world. I've also finished off some more squares for the SIBOL project which got sent out a few days ago. Sue who runs the project has already written a blog post about them (she is so very organised!) which you can find here. So much granny square goodness over there, even though I've just finished up a pile of squares it gets me itching to make a few more.